Custom properties must be configured by someone with developing skills. Custom properties allow you to target your visitors by custom properties -properties that you set up yourself. and purchased something at least 3 days ago. On your website, you can attach such properties to your visitors, so WisePops will be able to target these properties. 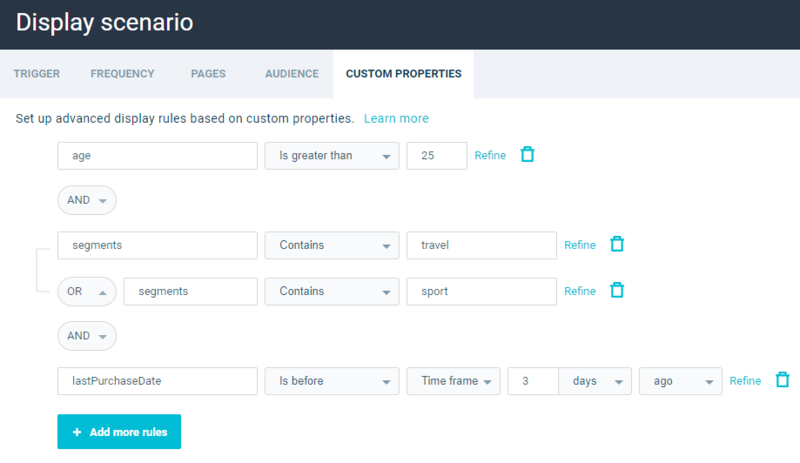 Data attached to your visitors are called Custom Properties. Rules based on custom properties are called Custom Conditions. "properties" : String that indicates that you want to define custom properties. Leave it as it is. customProperties : this is the dictionary of properties you know about the user, like email, name, age, etc. reset (optional) : By default, the custom properties are persistent. You don't need to write them on each page. If you do not want to keep previously stored properties, you can enter true as the 3rd parameter. To define your custom conditions, open your popup in the editor and click "Display Scenarios". Then, select "Custom Conditions". The custom properties dictionary must be a 1 dimension object. But you are also free to write dates as strings. This is equivalent to 2017-05-02 15:52:01 CEST . If no timezone is specified, dates will be handled as UTC. You can also test your configuration.